I achieved my Bachelor in Science Sports Therapy degree at the University of Teesside and Iï¿½m a member of the Society of Sports Therapists. 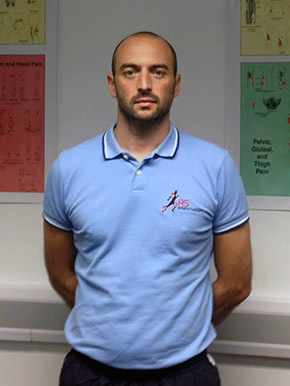 Previously I held roles within sports injury teams at Middlesbrough Football Club, Derbyshire County Cricket Club and currently working with Leicester City FC 1st Team as their sports masseur alongside the clinic. This work experience has allowed me to work closely with elite athletes and combine my love of sport and my work. Having worked within private practice for over a decade, I have been able to treat a wide range of sportspeople from many different disciplines. As a result of my diverse clinical experience, I have become proficient in many treatment modalities such as soft tissue manipulation, spinal and joint mobilisations, cryotherapy and electrotherapy to effectively treat general musculoskeletal conditions. Over the past few years I have been utilizing Acupuncture as a mode of treatment, from athletes through to the general public. 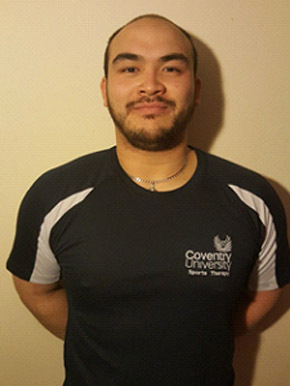 I am a graduate Sports therapist from Coventry University and also a member of the Society of Sports Therapist. Whilst at University I worked with multiple sports teams including Netball, Basketball and Rugby. My involvement with these sports led me to get nominated as Sports Therapist of the Year. I have also worked alongside Coventry Bears RLFC, which are a semi-professional team and I am currently working for Rugby School and Burton Rugby Club. All this previous experience has allowed me to treat a range of different injuries and problems that can occur. I have also worked clinically giving me valuable experience in using Electrotherapy, Cryotherapy and Joint mobilisations as well as basic spinal manipulations. I am also well proficient in sports massage. I have always been into sport, growing up I played my fair share of football, basketball, badminton and even trampolining which has given me to passion to continually help people achieve their goals.